When up-and-coming synth duo VILE ELECTRODES were named as OMD’s support for the German leg of the ‘English Electric’ tour, singer Anais Neon was in total shock at the news. Prior to confirmation, she said on Facebook “we have received an email of epic proportions but cannot divulge any more information until further notice”. Meanwhile for her partner Martin Swan, it was the fulfillment of a boyhood dream as OMD had been his first concert experience back in 1986! 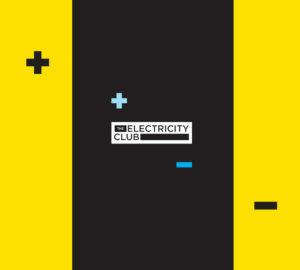 VILE ELECTRODES had been spotted by OMD’s Andy McCluskey while he was perusing The Electricity Club and obviously recognised a kinship via their exquisite songs such as ‘Deep Red’, ‘My Sanctuary’ and ‘The Last Time’. There was a definite magic with this duo who bring a unique twist to the sound of classic synthpop. Much preparation took place as Team Vile, augmented by technican and roadie Simon Forsyth, tour manager/merchandiser Rob Buxton and for the first part of the trip, merchandiser Graham Caley, readied themselves for life on the road. It was all terribly exciting and there was so much to organise including buying a vehicle worthy of transporting all the equipment and getting them across Europe too! The new van was also swiftly modified so that Anais and Martin could sleep on top of their highly valuable analogue synthesizers. Meanwhile, Simon would be following with all his wires and boxes in his faithful truck Nellie. Instruments were carefully chosen and these included Martin’s trusty Korg MS20 and Anais’ Roland RS09 String Machine. 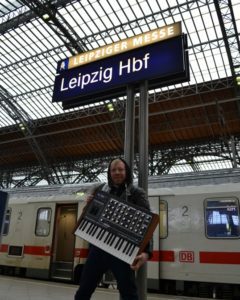 This late stage was probably not the time to be introducing a new bit of kit, but Martin being Martin (like a kid in a candy store) couldn’t resist getting his hands dirty on the appropriately named Leipzig that had arrived the day before. The first night of any tour is daunting but in Hamburg, there was one potentially trouser soiling surprise! “So whose stupid idea was this? Oh, Karl Bartos is here!” announced Anais on Facebook. Backstage after the show, “Karl Bartos, Paul Humphreys and Andy McCluskey were LOVELY” remembered Anais. “They were really happy to chat, which was lucky, as I’d had a drink and was high on adrenaline, so there was no shutting me us! We talked about my outfits and, of course, whether Andy and Paul should consider something similar for their shows! When we said our goodbyes, we expressed delight and honour at having gotten to meet the great KB. His reply? ‘No, no! We are colleagues’… COLLEAGUES OF HERR BARTOS! Amazing!”. First night nerves over with, Bielefeld turned out to be another big success and a sure sign that the rest of the tour was going to go be a blinder. With the tour moving to Berlin, Anais and Martin were taking everything in their stride and feeling quite calm about performing in front of their next big audience, having already tucked two dates successfully under their belts. After soundcheck, it was time to chill down. Team Vile tucked into the scrumptious delights that had been provided by a local catering company and relaxed alongside OMD’s crew members including Chicky, the chief sound engineer to watch ‘Star Wars – How It Should Have Ended…’ which brought about shrieks of laughter. In the vastness of Berlin’s Tempodrom, VILE ELECTRODES entered the stage, all colour co-ordinated in red and black, to a ripple of applause. Anais’ few words of German were very much appreciated and by the time they had played ‘Drowned Cities’, ‘Empire of Wolves’ and ‘Proximity’, they genuinely had the crowd on their side. After their set, a handful of the audience came to the merchandise stand to see what was on offer although very few made a purchase. However, after the OMD set, it was a very different story. The fans returned and the EPs were soon flying off the shelf. Anais and Martin were more than happy to pose for photographs, sign postcards and more importantly, talk to their new fan base. But not all the crowd had been charmed by VILE ELECTRODES, least of an OMD fan who bizarrely had a dislike of electronic bands as a puzzled 7und70 recollected: “There was this stupid woman who said: ‘I don’t like them, they’re not using real instruments’. So I said to her: ‘erm, you are here watching OMD, a synthpop band which means they make music with synths. VILE ELECTRODES are using those instruments so that’s not a good reason for saying that you don’t like them, what is the difference?’ But she replied: ‘they’re using sequencers… do you know what a sequencer is? Everything is pre-recorded, everything on stage!’”. It was amusing to see how people could draw strange arbitrary lines to suit their purist stances; maybe she should have listened more closely to OMD songs like ‘Metroland’, ‘Sailing On The Seven Seas’, ‘Locomotion’ and ‘Messages’ in her quest for a sequencer free nirvana? 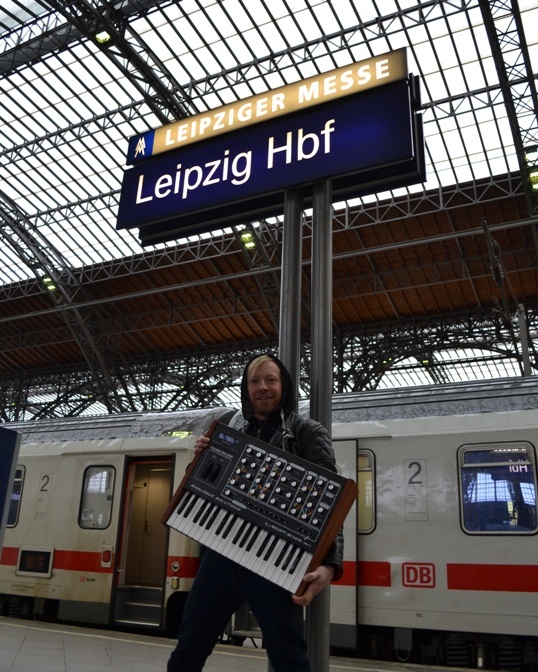 The following day was Leipzig so it was imperative that images of Martin’s Analogue Solutions Leipzig were captured in front of significant landmarks and prominent signage. Armed with the Leipzig and umbrellas, cameras were set up for the photo opportunity at the Battle of Nations Memorial despite the pouring rain. The Haus Auensee in Leipzig is a fabulous venue and has played host to many great names but specifically synth musicians ERASURE, PET SHOP BOYS and of course, the mighty KRAFTWERK. It is located in the heart of a forest, with a lake to the rear and a campsite opposite. From the front, it is a fairly nondescript building. However, the inside has a very different feel. The upstairs was already overwhelming with its semi-circular stone steps that overlooked the stage and its imposing ornate oval aperture that stood between the bar and viewing area. Due to renovation, only the ground floor was to open to the public so VILE ELECTRODES and OMD wouldn’t be playing to the full 3,500 capacity. With the merchandise stand set up inside the main hall, Team Vile were very much visible throughout OMD’s performance and could be seen singing and dancing very energetically, particularly to the encore of ‘Electricity’. After a comfortable night and a decent breakfast, they set off for the very long journey to Cologne with the prospect of a relaxing night off before the final gig of the tour. It rained, then rained some more and just when they thought they could give the wipers a rest, the rain started again. Stopping off at a little service station, Simon Forsyth’s trusty truck Nellie was topped up too with some transmission fluid. As they rolled out of the car park, Simon made a critical observation: “We don’t appear to have a reverse gear”! They crawled up the road far enough to establish that the situation was actually a lot worse. The Chevy was not changing gear. Nellie was poorly and needed immediate assistance. About an hour later they were rescued and found themselves at a dealership in Kassel. Essential equipment was quickly transferred from one wagon to another so that Anais and Martin could continue their journey while Simon would stay with his van until it was repaired. The team was now separated and the rest of Team Vile were left to their own devices to get to Cologne. Everyone arrived at the venue in plenty of time but there was no sign of Simon. Team Vile were clearly disappointed but the show had to go on and it just meant a re-configuration of duties. With the added news that the venue was going to take a commission on merchandise sales, everyone were all wondering if the last night might have a bit of grey cloud hanging over it. With Anais now clad in black trousers, under bust corset, sparkly bra and a vivid blue bolero styled jacket (all in latex of course), and Martin dressed as dapper as ever in matching colours, VILE ELECTRODES took to the stage, sounding awesome and delivering every song with total confidence. Martin was visibly relaxed and in control, even caught on camera singing his heart out with passion. They were on fire and once again the crowd responded favourably. As it was the final night of the tour, VILE ELECTRODES were granted an additional ten minutes so they could play ‘Deep Red’, the most epically OMD sounding track in their catalogue. Andy McCluskey was watching in the wings and said “It’s great to hear that played live” but after finishing the number, Anais apologised to the crowd as it seemed like her and Martin were at times playing two different songs. No matter, Cologne was another huge success. Crowds flocked to the merchandise stand again and Anais was even spotted singing ‘Happy Birthday’ into a video camera at one point. It was a moment she seemed to revel in, but not as much joy as when she spotted Simon in among the masses of new fans. “You made it” she shrieked, giving him a huge hug. Simon had unfortunately missed most of the concert but nevertheless his presence was most welcome. Team Vile were back together again. Cologne and indeed the tour had been a total triumph. Whilst OMD’s crew dismantled the set and packed up for their onward journey, Andy, Paul, drummer Malcolm Holmes and keyboardist Martin Cooper along with VILE ELECTRODES mingled among friends and some special guests. They just happened to be Wolfgang Flür, ex-KRAFTWERK and Ralf Dörper from PROPAGANDA. With a prestigious TV slot on ‘Later With Jools Holland’ performing ‘Dresden’, ‘Enola Gay’ and ‘Kissing The Machine’ to do the following day, the OMD frontmen had to leave the aftershow. “You’ve got my email address now so keep in touch” Andy remarked. “I’ll definitely come and see you when you play London” said Paul. When the guests had drifted away, only a handful remained with Malcolm and Anais plus the two Martins, Cooper and Swan, congregating in what was Andy McCluskey’s dressing room. The conversation was easy, with the other boys from OMD showing a great deal of interest in how Anais and Martin came to be together to form the band. All too soon, security were ushering everyone out. They stuffed the last of their belongings into holdalls and Team Vile slowly and somewhat reluctantly made their way to the doors. It was time for one last photo opportunity in the rear car park of E-Werk. Huddled in a circle, Team Vile bowed their heads downwards and with big cheesy grins snapped one last image. Germany was done. It had been a totally and utterly awesome experience for each and every one of them, but especially for Martin and Anais.